... and then your Blog turns 1! Still somewhat hard to believe, but What's For Lunch, Honey? has completed a whole year. A year of recipes, cooking, photographs, events, designing, struggling with template layouts and - the best of all - friends. Actually it looks like I am having a week of Birthday celebrations. The Daily Tiffin also turned one this week. Thank you for sharing your wonderful recipes, photos and for organising so many wonderful food blogging events. Auguri! And what a year!! continue like that please! Happy Birthday WFLH...party time !!!! Oh, Happy Birthday Meeta Blog! Happy Day to you. Great year Meeta, time truly flies, it will be a year for me next month...if not any other diary, atleast we have a food diary of what we cooked in the past 12 months...its been great to know you thru the blogging community! congratulations! and wishing many more such birthdays. i've enjoyed you blog thoroughly. Happy birthday Meeta. 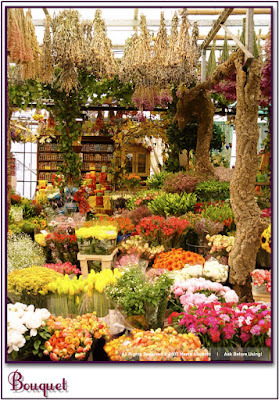 Oh, and I've been there - the Amsterdam flower market! It's amazing! You've accomplished so much in a year. Great job, and it's been so fun reading it all this time. Wow! Nice to join you on your first blog anniversary and the celebration time. Kudos on your accomplishments Meeta. Keep blogging. Happy Blog Birthday! Keep up the beautiful photos and delicious recipes. Wonderful Meeta! Your blog just keeps getting better and better! Happy birthday to your blog! It is one of my favorites! Happy Birthday - It's actually mine too, how cool! Happy Birthday! I'll drink a glass to you...like I need an excuse on a saturday night!! Congrats on a blog well done and always educative and inspiring. Looking forward to many more years reading it! Many happy returns, my friend! If you are a kid you`ve may be just started to walk..but you`ve already run that fast in a year time !!!! Nice entries every now and then. Felicitations, Xronia Pola, Gefeliciteerd, Feliz cumpleanos. You go girl. To many more years of food, pictures, blogging and enjoying. Oh my goodness! Folks, I thank you so much for all these wishes. It just determines what I thought all along. You people are absolutely incredible. Thank you for all your motivation too. I hope you will stick along for the ride in the second year! That was one eventful year Meeta. It was really wonderful getting to know you and to share your fun and experiences with food and travel. A very Happy Blogging B'day to you and hope to be frnds with you for a looong time to come. Happy, happy birthday! Keep blogging! A very Happy Blog Birthday Meeta!!! What a glorious year you've given us, full of incredible photos and mouthwatering recipes! Keep up the fabulous work my friend and we'll all keep coming back for more. Hi Meeta, Congrats! Wishing u many more 'blog years':) The bouquet is beautiful, I loved all the colours in there !!! Happy Birthday! Keep up with the good work! Happy Birthday Meeta, I'm sure you will look back and be pleased with all your efforts. I love coming to your blog to look at your pictures, read your posts and ofcourse the recipes :) So glad you are here! Happy Belated Blog Birthday, Meeta! I'm sorry to have missed it! Here's to another year of delicious and wonderful posts! We're both One! Happy B-Day!! Thanks for the kind words. I heart you all!